Course content: check back later. Cryosphere: the realm of frozen water. Includes snow, ice, and permafrost. Back at the start of 2016, I was based in Kathmandu as a research scientist with the International Centre for Integrated Mountain Development (ICIMOD). I’d been in Nepal for 3.5 years with my highly tolerant wife and young family, but it was time to head back home to Canada to be closer to parents and grandparents, siblings and cousins. After numerous expeditions in the high mountains, encounters with fantastic people from around the globe, and collaborative research on a range of high mountain topics, I was asked to anchor the synthesis chapter on cryospheric change in the Himalayas, Hindu Kush, Karakoram, and Tibetan Plateau region. I accepted, returned to Canada in July 2016, and three years later, I’m proud to highlight some of the results from our open access and peer-reviewed synthesis. Climate change signals are clear and present in the observations we have of glaciers and permafrost. We have less confidence in the signal of climate change in snowpacks and rivers due to a lack of systematic and long-term observations. Mitigation works. Reduced emissions now will reduce the impacts of climate change in the future. However, adaptation will be necessary, as future changes in the cryosphere and related water resources are already in the pipeline (pun intended). Coordinated and systematic data collection in targeted catchments across the region will help pin down uncertainties in the cryospheric responses (and impacts on hydrology, hazards, etc.) to future climate change. International/regional collaboration and data sharing will be key, and improved measurements will lead to improved models. Glaciers in most parts of the region have thinned, retreated, and lost mass. Notable exceptions to this include the Karakoram and western Kunlun Shan ranges. 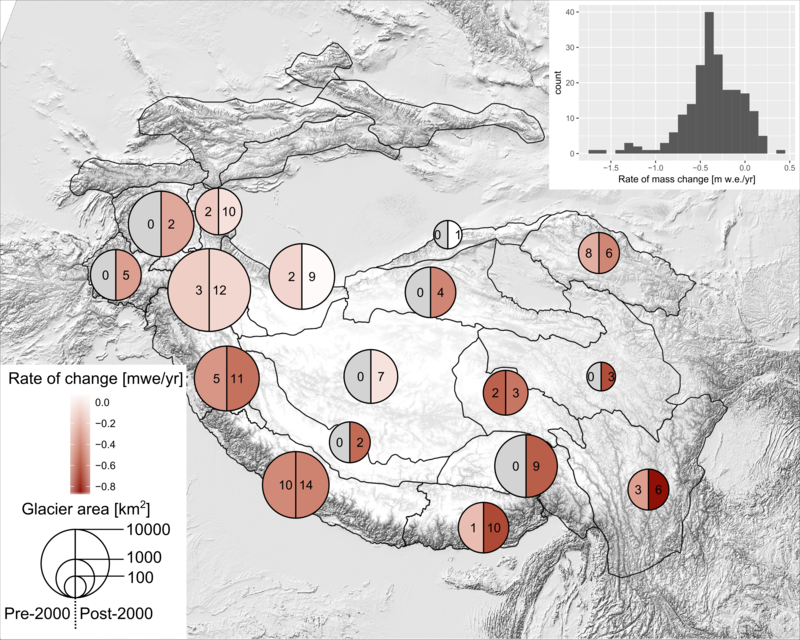 Patterns of glacier change derived from our synthesis of local studies match regional observations made by Brun et al. (2018) and Kaab et al (2017). Glacier mass loss will continue through the 21st century, but total declines depend on the emissions pathway we take. Under BAU (RCP6.0), we expect 50% volume losses by 2100. With RCP8.5, that could jump to 85% losses. Regional differences in rates of mass loss still apply, but nearly all models agree on the magnitude of future change. Loss of glaciers in the region is not a sea level rise story, despite what I’ve seen in a Thomson-Reuters wire piece. Back of the envelope calculations (thanks Bethany!) based on a rough estimate of 4000 km3 of ice suggest a maximum of 10 mm sea level rise. We need better observations of snowpacks from the ground and from remote sensing (airborne LiDAR, satellite altimetry) to evaluate changes in snow volumes across the region. This could be a highly sensitive (and hydrologically important) indicator of climate change. The response of snow and ice-melt fed rivers is complicated, and the natural variability of stream systems will limit our ability to detect a signal of change from the noise. Increased melt from glaciers will mean initial increases in flow, but once ‘peak water’ is reached and the glacier volumes decline then the ice melt contribution will decrease. It was an honour and a privilege to work with 20 scientists from 11 different countries on this report, but it was a lot of work . If nothing else, the media and public interest is encouraging. Summary of glacier mass change studies. Circle size represents glacier area within each region, shading represents pre-2000 (left) and post-2000 (right) estimates of mass change, and numbers within each half-circle indicate the number of studies. 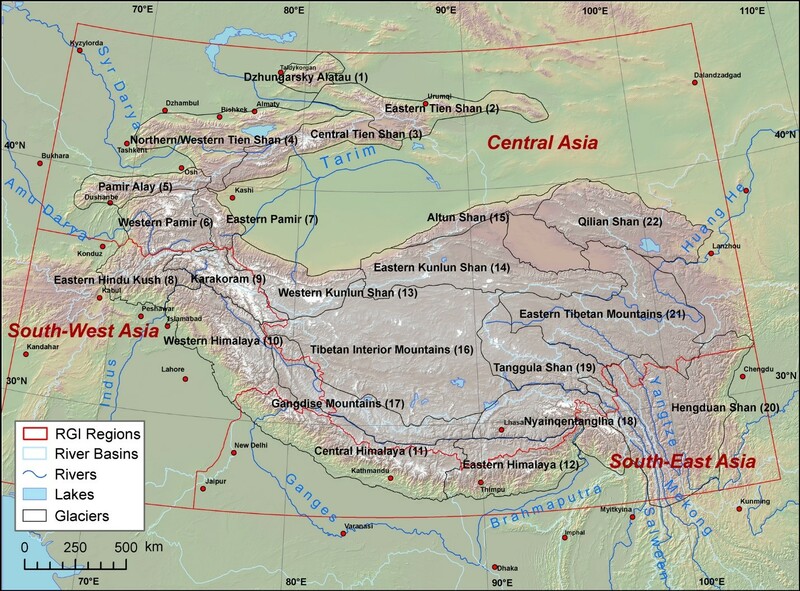 Projections of future glacier change in High Mountain Asia. Dashed and solid lines represent high-emission (RCP8.5) and moderate-emission (RCP4.0) scenarios. Once again, a large scale remote sensing analysis shows us which way the winds of (climate) change are blowing. This time the focus is on glaciers in western North America. New research published in Geophysical Research Letters [link] pinpoints the change in mass for every glacier in western North America between 2000-2018. The work, led by my colleagues Brian Menounos (UNBC) and Romain Hugonnet (CNRS, Toulouse), represents a huge advancement in our understanding of recent glacier change in the region [Disclaimer: I am a contributing author to this paper]. Its difficult to overstate the importance – and, until recently, the impossibility – of getting this information at continental scales. Traditionally, glaciers are measured by hand: spring field trips to measure winter snow accumulation, and late summer field trips to see how much snow was left up high, and how much ice had melted away down low. The glaciological mass balance is simply the difference between total accumulation and total melt, inferred from measurements made along the glacier from top to bottom. But these trips are tough, time-consuming, weather-dependent, and can be expensive to mount. They may also result in biased estimates of glacier mass change, and only a handful of glaciers in western North America have reliable long-term measurements using the glaciological approach. Our methods here follow a geodetic approach similar to the one used by Brun et al. (2018) to examine glacier mass losses in High Mountain Asia. We re-processed stereopair imagery from the ASTER satellite (2000-2018) to generate high-quality digital elevation models through time, and supplemented this with elevation models derived from Worldview and Pleaides imagery. For each pixel in these stacks of imagery, we calculate the trend between elevation change (dh, in m) and time (yr). From an assumed density of snow, firn, and ice, the changes in elevation are converted to changes in mass. 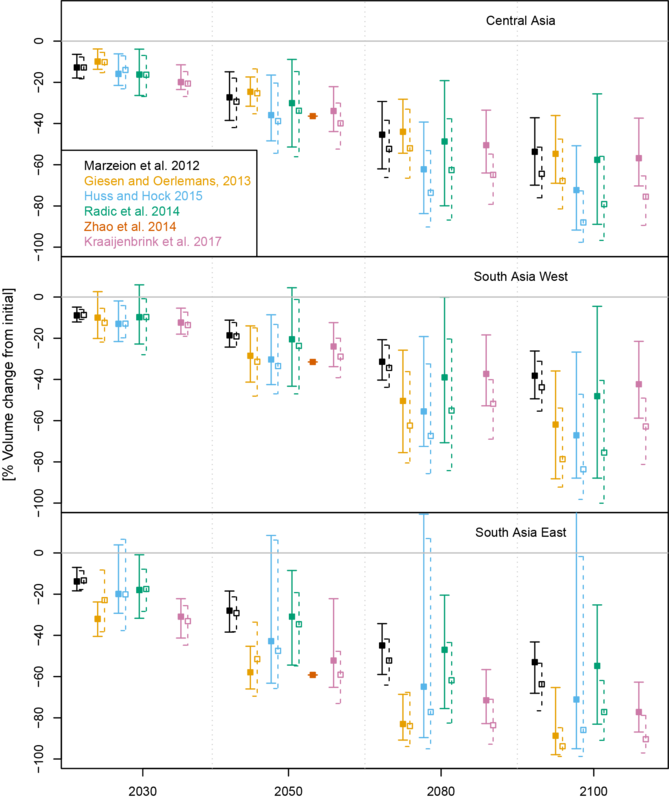 Gridded rates of glacier elevation change (2000-2018) for western North America: early (left), late (middle), and full (right) periods. Circle size is total glacier area in each 1×1 degree grid cell. The average rate of glacier mass loss for the entire period, over all WNA, was 452 (+/- 162) kg m2yr-1. With a total glacier area of 14,000 km2, that works out to over 600 million elephants worth of ice per year. There is short-term variability imposed on the long-term trend of glacier mass loss. Big increases (x6) in glacier mass loss were observed between early and later years of the study in the southern and central Coast Mountains of BC, which contain the largest volumes of ice in this region. A southward shift in the mean position of the jet stream is probably the main factor in #2: this reduced winter precipitation in the central and southern Coast Mountains, and led to more negative mass balances in the last 10 years. Conversely, the jet stream shift produced neutral conditions (and even slight mass gains) in areas that started to get more winter precipitation: the south Cascades and Glacier National Park. And what can we do with this information? We can develop and test regional scale models of glacier change and make improved projections of their future changes. The elevation changes also have an unexpected richness: off-glacier we can see the impacts of forest fires, mining and forestry activities, and forest regeneration. Stay tuned for future studies that incorporate this data! Some example maps of glacier mass change rates are shown below. Supplementary information (including tiles of the mass change rates) can be grabbed here. Peyto Glacier and the Wapta Icefield, from historical topographic maps (1919), GLIMS glacier outlines (purple), and a recent Landsat 8 scene. The survey maps from 1919 show glacier boundaries that line up well with the maximum glacier extents. Look for the trimlines that mark boundaries between vegetated areas and deglaciated areas. Significant retreats of Peyto Glacier, Bow Glacier, and Baker Glacier are clear from the animation. What’s less obvious is the change in surface height: not only are these glaciers melting back faster than they are advancing, but they are essentially deflating. Surface lowering is probably reducing the total volume of this ice mass faster than the retreat itself. The topographic maps were constructed A.O. Wheeler, a pioneer of photogrammetry, and his survey team. Traversing up the divide between Alberta and British Columbia, Wheeler and his team set up and surveyed benchmark positions, and collected photographs from passes and high points all the way from the US border to north of Mt. Robson. Their expeditions took place over multiple seasons, with a median year of around 1919. Christina Tennant and Brian Menounos published a neat study in 2012 on historical glacier area change in the Rockies using these maps. Having skiied the Wapta traverse a few years ago (okay, more like 15 years ago) the rate of glacier change that these historical data show really puts things in perspective. As in, you might be able to do the traverse without worrying about crevasses by the middle of the century. Thanks, #climatechange. Overnight yesterday and today (12 September), a wildfire that had been burning near Waterton Lakes National Park exploded in size and triggered mass evacuations. This post is motivated in part by the stories that have continuously emerged from western Canada in the summer of 2017. Stories of people evacuating in the middle of the night with 20 minutes notice; stories of people losing everything they owned, their livestock, their pets. Stories of the fire crews and support crews and volunteers who have worked incredibly hard throughout the summer to minimize the damage and support those affected by the fires. In western Canada, from the Prairies to the Central Interior of British Columbia (BC), the summer of 2017 was hot by any standard. How hot was it? I coded up a simple Google Earth Engine script to calculate average daytime and nighttime surface temperatures for July and August 2017, and compared these with the average between 2000 and 2016 (Figure 1). The code uses surface temperatures measured from the MODIS Aqua satellite operated by NASA (MYD11A1). Daytime surface temperatures in July and August were up to +5 C warmer than the 2002-2016 average (Figure 1) over a large part of the prairies, and between 0 and +2 C warmer through much of southern BC. More than 1200 wildfires burned over 11,000 square kilometers in BC alone through most of the summer, leading to the evacuation of more than 45,000 people from their homes. Interestingly, nighttime temperatures on the prairies were close to normal, but 2-3 C above normal in the mountains. Nighttime surface temperature anomalies for July and August 2017, from MODIS TERRA. Is the summer of 2017 a preview of the new normal? Average annual temperature increases of 4-7 C are projected for much of western Canada by the end of the century, depending on which emissions scenario the world follows. While moisture and forest management techniques are also an important part of the wildfire equation, the way human activities are changing the atmosphere will result in increased extreme fire weather conditions, and a longer fire season. The Global Precipitation Measurement (GPM) mission uses satellites to estimate rainfall rates over most of the globe. These data have already been used elsewhere to examine Harvey, and a short Google Earth Engine script can be used to map preliminary rainfall totals. The magnitude of the accumulated rainfall in the Houston area is mind-boggling, but the GPM estimate appears to be about half of what has been observed on the ground. Whats more astounding is that recent rain events in Nepal, India, and Bangladesh are of a similar magnitude and cover an even larger area. You might have missed the events that have taken place in South Asia in the past few weeks, and accurate tallies of the precipitation totals are slow to come out from the region. But the impacts of the floods are being felt by hundreds of millions. Using Google Earth again, with the same spatial scale and the same colour scale, I mapped the accumulated precipitation between 8 August and 15 August, when the flooding peaked. Total estimated precipitation amounts more than 500 mm cover a large swath of the northern plains, along the borders of Nepal, India, Bangladesh, and Bhutan, with peak precipitation amounts over 1000 mm in Bangladesh. Updated precipitation maps for south Asia, 8 – 15 August 2017. GPM IMERG data processed in Google Earth Engine and plotted in QGIS. For now, the focus needs to be on the people who are still in trouble or just starting to pick up the pieces. As with most natural disasters, the poorest will be hit the hardest: 80% of those hit by Harvey have no flood insurance, and in thousands of remote villages in SE Asia basic food, water, and sanitation needs are not being addressed. The role that climate change may or may not have played in both Hurricane Harvey and in the south Asia floods will be examined long after the flood-waters recede. But both events have taken place against the backdrop of a warming atmosphere and warming oceans, and may represent a new reality. Anomalous snowfall: did it amplify the earthquake-triggered Langtang avalanche? The disaster that unfolded in Langtang Valley in the moments after the M7.8 Nepal Earthquake on 25 April 2017 is difficult to contemplate. The earthquake-triggered collapse of glaciers high above the serene village of Langtang Valley contributed to a devastating avalanche that swept down from the mountains with a leading edge of straight-line winds that approached major tornado strength. New research led by Koji Fujita from Nagoya University, published in the open-access journal Natural Hazards and Earth System Science (link), suggests that the avalanche may have actually been composed primarily of snow. The intersection of a rare (1 in 100 to 1 in 500 year) snowpack and a major earthquake (1 in 80 years) led to one of the biggest mass casualty events of the earthquake. Perspective views of Langtang Village avalanche deposit. (a) orthoimage, and (b) pre- and post-event elevation difference. In the paper, we use a combination of data collected from helicopter and UAV surveys in the days and months after the earthquake to quadruple previous estimates of the total volume of the avalanche deposit (Figure 1 above). Koji, who has worked in the valley since the 1980s and is well known by the villagers, also interviewed locals who witnessed the blast to help constrain the sequence of events. Finally, we pieced together weather station data from the valley (ICIMOD/DHM) and regional precipitation fields to determine the return period for a winter snowpack of this magnitude. The winter of 2014-2015 was particularly wet: the passage of Cyclone HudHud in October 2014 dropped upwards of 300 mm of precipitation in the Langtang region, and caused numerous avalanche fatalities on the famed Annapurna trekking circuit. When I visited Langtang Valley after the earthquake, most of our stations appeared to be destroyed by earthquake-triggered avalanches. However,after recovering the dataloggers and downloading the data, it became clear that some were toppled in the middle of winter by avalanches that also took out entire yak herds (according to the locals I spoke to). The stations that remained standing during the winter told the story of near-continuous snowfall from early March to 25 April (Figure 2). If snowfall during the typhoon is included, snowpacks may have been up to 3.5 m at high elevations. This snowpack only needed a trigger to go off, and on 25 April at 11:57, it got two: one from the ground motion, and one from the glacier ice cliff collapses. Our results have been shared with both local and government officials, but hotels have already started to appear in the rubble that lies over the avalanche. On the second anniversary of the Gorkha Earthquake, I gave a webinar on my time based in Kathmandu for the Association of Polar Early Career Scientists (APECS). It was primarily a research talk, but targeted towards early career researchers who may be contemplating a non-traditional position (i.e. not a post-doc or a tenure-track position). To keep the talk interesting I also got to talk about mountain biking, being in a Kathmandu cover band, and my personal experiences in dealing with the earthquake. Our goals with these repeat surveys during the melt season (April – ????) are to develop estimates of snow melt rates from a variety of slope aspects and angles, to look at thermal aspects of snow melt (enhanced melt rates and heat advection from vegetation, rocks), and to build datasets that can be used to validate distributed snow hydrology models. We’ve only managed to sneak in one flight so far, but the new S.O.D.A. camera from senseFly seems to work very well with the eBee RTK. A rare moment of relative calm, jacket thrown over the laptop to try and cut the glare from the snow. From our first flights of 2017: a closeup of the digital elevation model with shading (left) and the same scene shown as an orthoimage (right). Sleds show up nicely, and you can even see our footprints in the snow heading to the upper right corner of the scene.